Today’s passage of Tobacco 21 (A273) in the state Assembly’s Health Committee was a positive step forward in preventing New York’s youth from becoming addicted to tobacco, the No. 1 preventable cause of death in New York and a leading risk factor for heart disease, stroke, cancer, lung disease, diabetes and asthma, according to public health groups who have been advocating for this measure. Several organizations applauded the Health Committee, and sponsor Assemblywoman Linda Rosenthal, D-Manhattan. The health committee took an important step today by approving Tobacco 21, and we applaud their action on behalf of all of New York’s youth. Smoking kills 28,200 New Yorkers, and costs the state $10 billion in health-care expenses every year. Ninety-five percent of smokers begin before they are 21. The tobacco industry is on the record saying if they don’t have a committed smoker by 21, chances are that person won’t be a life-long customer. And people 18 – 21 years old often provide cigarettes to younger kids. Today’s vote is an important step toward getting Tobacco 21 passed into law – and protecting kids and saving lives – before the Legislature adjourns next week. From the health committee, Tobacco 21 goes to the Assembly Codes Committee. Tobacco 21 is currently in the Senate Finance Committee. Will Legislators pick the side of Public Health or Tobacco and E-cigarette Interests? With the clock ticking on the New York State legislative session, groups representing children, public health organizations and medical professionals have joined forces to kick off a campaign calling on both houses of the state legislature to “Pick a Side” on the issues of e-cigarettes and raising the age for the sale of tobacco products to 21. Will the legislators and their leaders be on the side of public health and kids? Or on the side of e-cigarette and tobacco companies? Over 20 percent of high school students in New York now report using e-cigarettes yet the New York State Senate continues to stall on legislation (S2543) to add e-cigarettes to the Clean Indoor Air Act. In addition, 15.2 percent of adults are still smoking and the advocates are urging passage of legislation (S3978/A273) that would raise the age for the sale of tobacco products to 21 (Tobacco 21). The New York State Assembly has already passed the e-cigarette loophole bill three times. The groups are asking Senate Leadership to decide if they will be on the side of children and public health or be on the side of tobacco and e-cigarette companies by holding up the bill and putting the health and lives of their constituents at risk. Members of both houses of the legislature are also being asked if they will be on the side of tobacco companies or protecting the public’s health when they decide on the Tobacco 21 legislation. Approximately 95 percent of adults who smoke started before the age of 21. A report by the Institute of Medicine predicts raising the national minimum age for the sale of tobacco products to 21 will likely lead to a 12 percent reduction in smoking prevalence. Dropping off hundreds of petitions in support to member offices. Phone calls to targeted legislators. Calling on their legislators on social media to take a stand. New York State expanded the Clean Indoor Air Act in 2003 to include all indoor workplaces. E-cigarettes were not included as the products didn’t exist at that time. Now that these products are widely used, the Clean Indoor Air Act must be amended through this legislation to ensure the air that children, families and workers breathe in public places is clean. “It’s unbelievable that Big Tobacco and e-cigarette companies hold such power in New York. Tobacco and e-cigarette companies are benefiting at the expense of our kids. It’s time for senators to put kids and the public’s health before e-cigarette company profits,” said Julie Hart, American Cancer Society Cancer Action Network (ACS CAN) New York director of government relations. “The importance of closing the loophole in New York’s smoke-free air law cannot be overstated. New York’s smoke-free law was a monumental measure to protect our kids when it was passed over a decade ago. To continue that success, the law must be modernized to reflect the vast increase in e-cigarette usage. All New Yorkers deserve the right to breathe clean air, the Senate must act,” said Jeff Seyler, President & CEO of the American Lung Association of the Northeast. “Including electronic cigarettes in the state’s Clean Indoor Air law will further the fundamental purpose of the law – to protect everyone’s right to breathe clean air in workplaces and public places. New York’s comprehensive smoke-free law covering all restaurants, bars and other workplaces, has been in effect since 2003. We need to prevent e-cigarettes from undermining this important public health protection. Smoke-free laws create an environment that encourages smokers to quit and discourages kids from smoking. This legislation will preserve these benefits,” said Kevin O’Flaherty, Director of Advocacy, Northeast Region, Campaign for Tobacco Free Kids. “These are common-sense policies, supported by evidence, that will advance public health and benefit both individuals and communities We have a significant opportunity to save lives by reducing tobacco use, particularly among children, and to ensure that everyone can breathe clean air in public spaces,” said Andrew Hyland, PhD, chair of the Department of Health Behavior at Roswell Park Cancer Institute. “We know that approximately 90 percent of addicted adult smokers experimented with or began smoking before age 18. We also know that tobacco companies spend millions of dollars marketing their products in stores that children and teens frequent. Raising the age of purchase of tobacco products to 21 makes it less likely that our youth will become addicted to nicotine. This change in the law is an evidence based prevention strategy that works and we need to implement it statewide, now,” said Carol M. Smith, M.D., M.P.H., President, New York State Association of County Health Officials. “We support every effort to reduce young people’s access to tobacco products, and every initiative to reduce their exposure to second hand smoke. Therefore, we call upon the State Senate to pass legislation adding e-cigarettes to the Indoor Air Act now. In addition, we call upon the legislature to pass Tobacco 21 before this session ends. Any delay in moving this vital public health initiative forward increases life time health risks to more and more young people who start smoking as teens and suffer significant health complications as adults. There is no defense for the tobacco industry in New York, our children should come first!” said Elie Ward, Director of Policy & Advocacy NYS American Academy of Pediatrics. “There are numerous and well documented dangers to using tobacco including electronic cigarettes at any age and all the dangers are increased when use begins before adulthood. Given the known toxins, chemicals and metals in electronic cigarettes, we must take immediate action to include them in the state’s clean indoor air law to ensure that children, pregnant women, workers and others are not exposed to their aerosols in public places. Also since the drinking age was raised from 18 to 21 there have been national decreases in overall consumption of alcohol, drunk driving, and motor vehicle accidents among young people, serving as further evidence that a similar law for tobacco products would be just as successful. Family Physicians throughout the state urge our senators to do the right thing and pass this legislation this session,” said Robert Ostrander, MD, President of New York State Association Family Physicians. “Eleven out of 58 counties in New York State have adopted the Tobacco 21 ordinance. We urge the legislators to follow Hawaii, and California, who have already passed state-wide Tobacco 21 laws. Adding Electronic Nicotine Delivery Systems (ENDS) to the Clean Indoor Air Act is the next logical step to maintain the health of our constituents,” said Susan M. Franko, PhD, RRT, President, New York State Public Health Association. Legislation to close the e-cigarette loophole has already been passed and enacted in eight New York State Counties and New York City as well as 10 states. Tobacco 21 laws have already been enacted in New York City as well as nine other counties and two localities. The United States Surgeon General reported that youth use of nicotine in any form, including e-cigarettes, is unsafe. Studies have concluded that e-cigarette aerosol is not harmless and it is not merely water vapor. E-cigarette aerosol contains fine particles of liquid, solids like harmful metals, or both. One study found up to 31 constituents in the aerosol, including nicotine, acetaldehyde, and diacetyl, a chemical linked to serious lung disease. The e-cigarette loophole legislation will protect New Yorkers from secondhand exposure to nicotine and other known toxins found in e-cigarette aerosol. It will also help ensure that the public health benefits of smoke-free laws are not undermined. They come from different parts of the state, and they’ll all be dressed in red. Advocates with the American Heart Association will hit the halls of the Capitol buildings today, MONDAY, MAY 1, to ask their representatives to raise the age to purchase tobacco products to 21. Tobacco 21, (S3978/A273), is sponsored by state Sen. Diane Savino, D-Staten Island and state Assemblymember Linda Rosenthal, D-Manhattan. Savino and Rosenthal will meet with the American Heart Association advocates in Meeting Room 2 of the Empire State Plaza before they begin their legislative visits at 11:30 a.m.
Nine localities in New York, and 226 across the country, have already passed Tobacco 21. American Heart Association advocates will be joined by representatives from the American Lung Association, the Campaign for Tobacco Free Kids, and the New York State Public Health Association. Deborah Flaherty-Kizer, in red, talks with the Cardiac Kids and their families on Saturday, April 29 at the American Heart Association. When Deborah Flaherty-Kizer was born nearly 60 years ago, her parents were told, “Your baby might not live.” She was blue and only weighed 4 pounds. After her admission to the US Naval Academy was rescinded due to a “heart issue,” she was diagnosed with Ebstein’s Anomaly. She had her first open-heart surgery two years ago. On Saturday, April 29, Deb joined the Cardiac Kids Paint Party at the American Heart Association to share her story. The Cardiac Kids are children born with a congenital heart defect, and their families, who meet regularly. “My goal has always been to thrive, not just survive,” said Flaherty-Kizer, who has written a book called A Journey of the Heart: Learning to Thrive, Not Just Survive, With Congenital Heart Disease. You can meet The Cardiac Kids at the June 3 Capital Region Heart Walk and Run. Sign up now at CapitalRegionHeartWalk.org! Beacon Health Options is the sponsor of The Cardiac Kids. 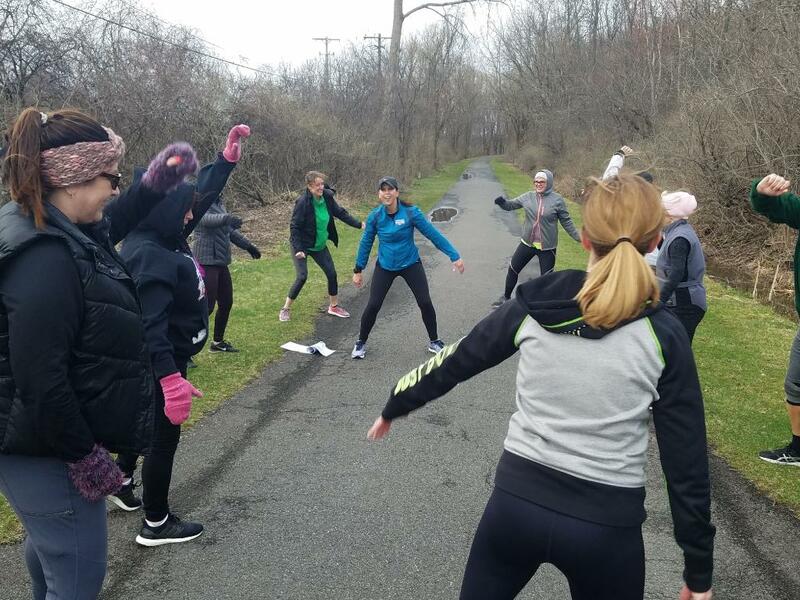 Fighting heart disease and stroke has added a new component in 2017: a 5-kilometer run as part of the American Heart Association’s largest fundraising event, the Capital Region Heart Walk and Run. “I’m honored to chair the 2017 Capital Region Heart Run and Walk, and excited that, for the first time, the event will feature a 5K,” said Denise Gonick, president and CEO of MVP Health Care. The Capital Region Heart Walk and Run will take place on Saturday, June 3 at the University at Albany. Activities and registration begin at 8:30 a.m., the Run begins at 10 a.m., and the Walk steps off at 10:05 a.m. This is the second time that Gonick has served in a leadership role with the American Heart Association. In 2012, along with Lynn Oliker, she chaired the Go Red for Women Luncheon. Gonick is working with an executive leadership team to make the Capital Region Heart Walk a success. Its members are Ellen Sax, MVP; Barb Hess, SEFCU; Karen Magee, NYSUT; Dr. Suzie Mookherjee, Albany Medical Center; Lee McElroy, RPI; Paul Milton, Ellis Medicine; Daniella Bigalli, Homestead Funding; Harold Iselin and Jennifer Gomez of Greenberg, Traurig, LLP; Peter Connolly of Keeler Mercedes; and Rob Lamoureux. Gonick has been president and CEO of MVP Health Care since 2012. In that position, she oversees a company with 700,000 members and 1500 employees. Before becoming president and CEO, she was executive vice president of administrative services and chief legal officer at MVP. Gonick is a native of Long Island and a graduate of Hofstra University and Albany Law School. She and her husband Steve live in Guilderland with their two daughters. She serves on the Board of Directors for the Business Council, The Capital Region Chamber, The Center for Economic Growth, and for Proctors Theatre in Schenectady. In January 2017, the Capital Region Chamber named her chair of its board. The Capital Region Heart Walk and Run is set for Saturday, June 3, at the University at Albany. Activities and registration begin at 8:30 a.m. The 5K run will begin at 10 a.m. and the Walk will start at 10:05 a.m. Denise Gonick, president and CEO of MVP Health Care, is chairing the Capital Region Heart Walk and Run. Rosalyn Wallace is the Stroke Ambassador and Ryan Galvin is the Heart Hero. Cody Holyoke of CBS 6 and Sean McMaster of B95.5 will co-emcee the Heart Walk. There will be health screenings, a Kids Zone, a tribute to survivors, and a Memory Lane to honor lost loved ones. Subway is the national sponsor of the Capital Region Heart Walk. Local sponsors include MVP Healthcare, CSEA, Ellis Medicine, Homestead Funding Corp., St. Peter’s Health Partners and SEFCU. Albany Medical Center is the Life Is Why sponsor. Media sponsors are All Over Albany, B95.5, CBS 6 and the Times Union. For information, visit CapitalRegionHeartWalk.org, or contact Kim Sheedy or Jessica Pettengill at Kim.Sheedy@heart.org, 518.626.8757, or Jessica.Pettengill@heart.org or 518.626.8768. 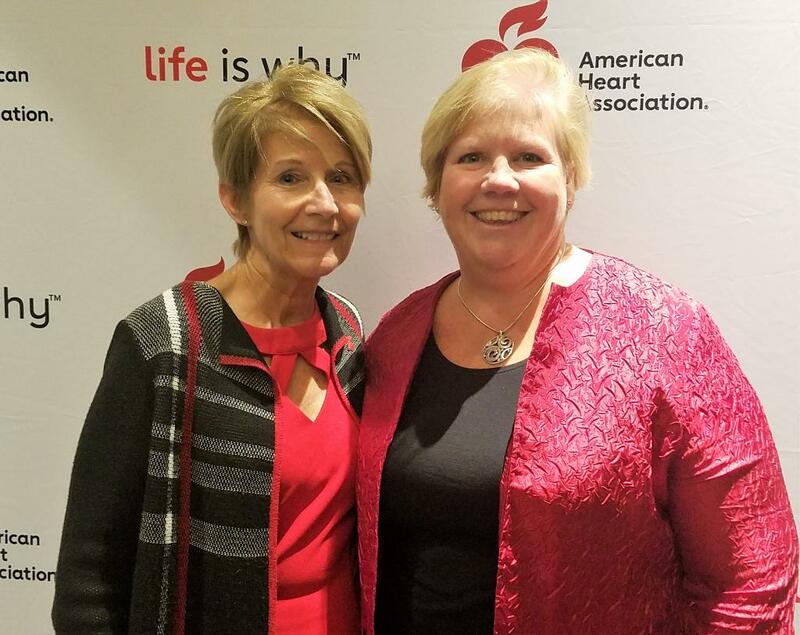 The American Hearst Association announced today that Woman’s Day Editor in Chief Susan Spencer will give the keynote address at the 2017 Go Red for Women Luncheon, the 13th annual gathering of Capital Region women committed to fighting the No. 1 killer of women, heart disease. The luncheon will be held Thursday, May 25, at the Albany Marriott. As Editor in Chief of Woman’s Day magazine, in 2013 Susan led the creation of the Live Longer & Stronger Challenge, a heart health–focused editorial franchise that puts a spotlight on women’s heart health by inviting five women to improve their health over the course of eight months. The magazine showcases their progress to its readership of 22 million, and at their annual Red Dress Awards, significantly raising awareness of heart disease in women. “Woman’s Day has been a champion of heart health awareness for over two decades and I’m honored to share how making time for oneself can truly have a profound impact on the way women manage their health,” said Susan Spencer, Editor in Chief of Woman’s Day. Prior to joining Hearst in 2012, Spencer was executive editor of All You magazine, published by Time Inc., and held senior editorial positions at Child and Diversion magazines. She also worked for Time Inc. Strategic Communications, Time Inc.’s custom publishing unit, producing magazines for corporate clients including Pfizer and American Express. Spencer graduated from Connecticut College with a B.A. in French and European History. She lives in New Jersey with her husband and two daughters. The 2017 Capital Region Go Red for Women Luncheon is set for Thursday, May 25, 2017, from 10 a.m. to 1:30 p.m. at The Albany Marriott. Theresa Petrone of CAP COM Federal Credit Union and Leah Slocum of the Peak Residential Partners Team at Realty USA are co-chairs. Benita Zahn of WNYT is the emcee, and Susan Spencer, editor-in-chief of Woman’s Day magazine, is the keynote speaker. There will be health information, health screenings and a silent auction featuring “Purse-Onalities” donated by local businesswomen. The 2017 BetterU class will be introduced. Albany Medical Center is the Life Is Why sponsor. Sponsors include CAP COM Federal Credit Union, Ellis Medicine, SEFCU, CDPHP, Crisafulli Bros., CapitalCare Medical Group, The Golub Family Foundation, St. Peter’s Health Partners and the Capital District YMCA. Media sponsors include All Over Albany, The Albany Business Review, WNYT and B95.5. Women@Work is the media sponsor of the BetterU. For information, visit CapitalRegionNYGoRedLuncheon.heart.org or call 518.626.8759. Woman’s Day empowers 22 million American women to enrich their lives with joy, purpose and positivity. WD is her compass, helping her navigate both short-term goals—like producing a delicious dinner on a moment’s notice or sneaking 10 minutes of exercise into her day—and her long-term aspirations for a healthier lifestyle. We engage her with easy, wallet and time-friendly solutions that are both actionable and attainable, delivered in a relatable voice. Above all, WD celebrates and speaks to our readers’ deep commitment to family, community and faith by showcasing uplifting stories and introducing her to women like her who are living their values. We help make every Woman’s Day count. Woman’s Day is published by Hearst Magazines, a unit of Hearst, one of the nation’s largest diversified media and information companies. With 21 titles in the U.S., Hearst is the leading publisher of monthly magazines in terms of total paid circulation (AAM 2H 2014), reaching 78 million readers (Spring 2016 MRI/GfK at 79.5 million) and 54 million site visitors each month (comScore), with a social media following of 115.5 million. Follow Woman’s Day on Facebook, Twitter and Pinterest. Keep the funding for public health programs! PLEASE TAKE ACTION TODAY, MARCH 30! The state Legislature is talking about cutting state funding for public health programs by 20% as part of a state budget deal. We can’t jeopardize important hypertension, obesity prevention and other chronic and infectious disease prevention efforts for underserved New Yorkers. Please call the leaders of the Legislature today. Here are their numbers and suggested script. It literally only takes a minute or two. My name is [_____], from [CITY]. I am calling to strongly oppose any cuts to the state health department and public health funding. Public health programs save lives. You cannot negotiate away critical prevention programs for those who need them most. Thank you. You will likely just be asked for your name and leave a message. Your voice can save lives!!! Bob Elling, left, chair of the New York State Advocacy Committee of the American Heart Association, and Kristin Salvi, New York government relations director of the American Heart Association, strategize about ways to get the Empire State Trail funded in New York. National outdoor co-op REI, the American Heart Association, and the Healthcare Association of New York together announced their support today for the Empire State Trail, a proposal in Governor Cuomo’s executive budget to complete the nation’s longest multi-use trail in the next three years. The trail will serve as a “spine” connecting multi-use trail systems across the state, from New York City to Plattsburgh and Buffalo to Albany.